When I was in fifth grade, I was all about sharks. My favorite book was about sharks; my father even woke me up on school nights to see the shark specials on TV. I didn’t realize then that my 10 year old peers did not share my love or fascination with these creatures of the deep. Now, however, I do see that people are unnecessarily afraid of sharks. I think it’s about time a few more people disregard the scary myths, and start learning how awesomely-cool they are! *Sharks have been around since before the dinosaurs, more that 300 million years. They have changed little over time and are sometimes called living fossils. *Sharks’ skin was used to polish wood before the invention of sandpaper. It is covered in teeth-like projections called denticles. Most sharks’ dermal denticles point uniformly towards their tail. The exception to this is the Basking shark, whose denticles point every which-way! Some Norwegians line the bottoms of their boots with Basking shark skin to help with traction on slippery, wet surfaces. 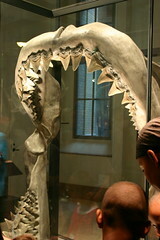 *The extinct Megalodonwas the largest shark to ever exist. It had teeth the size of a human hand. As a sidebar here, I was out at a conference touting the wonders of the Museum and showing off some impressive fossils, one of which being a shark’s tooth – not a megalodon, but still impressive. I was holding it for a teacher to see its serrated edge and it actually cut open my finger. Who else can say they were bitten by a million’s-of-years-old shark?! *Great white sharks live about 25 years. They do not start reproducing until they are around 20, and only have around 2 litters of 6-7 pups in their lifetime. Some scientists believe there are only around 10,000 in the world. As an apex predator, they are at the tops of the food chain and are needed to maintain balance in their respective ecosystems. *Some sharks only grow to be 8 inches long! 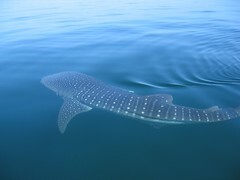 *The largest shark today is the Whale Shark, which can grow up to 50 or 60 feet long. Don’t worry, though, they’re filter feeders that eat plankton! *More than 375 species of shark have been discovered so far; less than a dozen of these are dangerous to humans. Also, 90% of all shark attacks, of which there are around 100 per year, end in the victim’s survival. This is because humans are not sharks intended prey. They take a taste – the sharks’ equivalent of sampling the menu – and spit out what turned out not to be a fish or a seal. As you can see, sharks are not the vicious predators driven by blood lust that popular culture has made them out to be. Just respect them, and try not to dress up like a seal when you go swimming off the coast of South Africa. (Just kidding.) Have no fear of our finned friends! If you want a truly viscous predator, look no further than the hagfish.